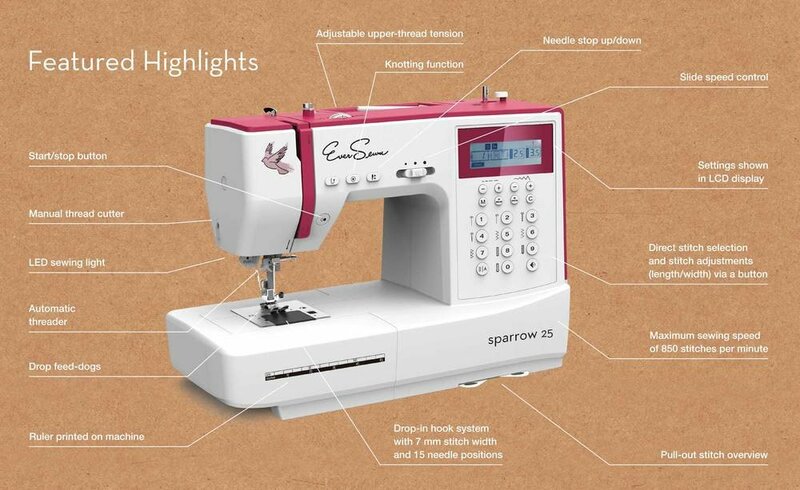 The EverSewn Sparrow 25 is a computer-controlled sewing machine that offers everything a creative sewer could need. The Sparrow 25 has 197 stitch patterns in total, including an alphabet, seven buttonholes and an eyelet stitch. Decorative stitches stitch up to a width of 7 mm and the memory function allows individual stitch combinations to be saved. The start/stop function lets you control the stitching process without using the foot pedal. The needle up/down function allows you to specify the needle position at end of a row helpful when stitching corners or curves. The EverSewn Sparrow 25 includes seven presser feet. Length of freearm to the right of the needle: 6.4"